Chafing occurs with friction against the skin and causes uncomfortable irritation on the skin. A triathlon increases the risk of chafing because of the sweat and moisture generated during the race. 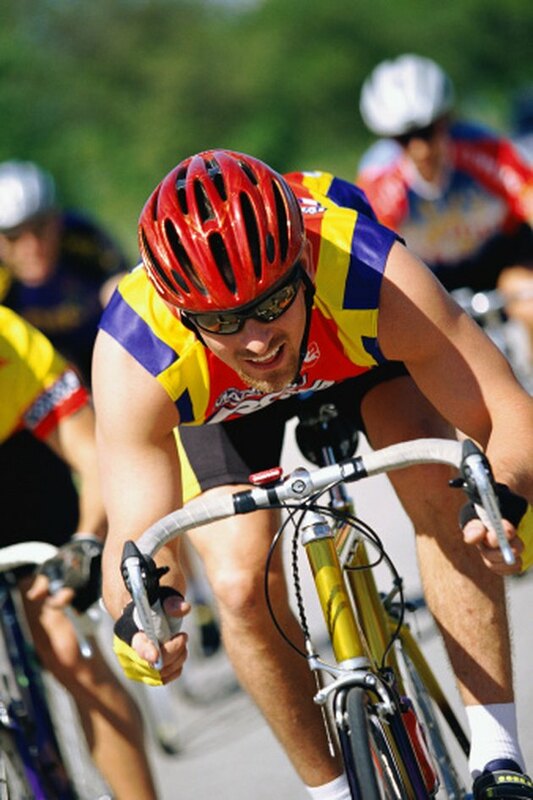 The biking portion of the race leaves you exposed to chafing where the bike saddle rubs against your legs. The chafed areas can become painful and may worsen over the course of the race, sometimes developing into an open wound. Your clothing choice, gear and preparation for the race helps prevent the discomfort of chafing during a triathlon. Adjust your bike seat before the race to avoid too much tilt forward or backward. Test out the adjustment before the race to make sure it doesn't increase chafing. Try a different saddle if your current one tends to rub. Often a narrower seat helps because there is less area to create friction. Move your razor with the hair growth if you shave your legs. Apply moisturizer after shaving to prevent razor burn or ingrown hairs that could making chafing worse. Wear clothing that dries quickly and wicks moisture away from the body, such as a specially designed tri-suit. Test out the clothing you plan to wear before the race to ensure it feels comfortable, draws away moisture and doesn't rub. Clean the clothing before the race so you don't have sweat remnants and other potential irritants on the fabric. Dry your skin with a towel before getting dressed on race day. This helps eliminate any initial moisture that could increase chafing. Dry your skin again if you change clothing during the transitions. Apply a water-based lubricant or special athlete lubricant to areas susceptible to chafing, such as the groin area, shoulder area for women, armpits and the neck area depending on where your swimming clothes rub. Reapply the lubricant as needed if you change clothing at the transitions. Some triathletes also use cooking spray to help get the wetsuit on and prevent chafing. Do a trial run with the gear you plan to use, including lubricants, before the race to make sure they don't make chafing worse.